A question my parents, friends, relatives and unknown strangers ask (Why I bungee jump). Why would you jump off of a perfectly good bridge? Or a bad bridge for that matter? 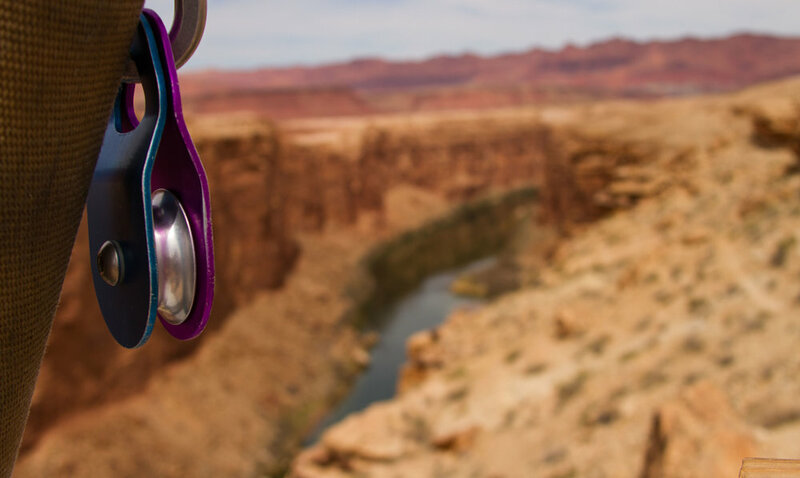 From the Navajo Bridge near Page, Arizona. A Perfectly good bridge in the sensational Grand Canyon. Photo by Dave Nevins. My adventurous life of jumping from bridges, out of airplanes (tandem jump), base jumping (tandem jump), rope jumps and swings from bridges, mountain climbing, rock climbing, caving, and organizing extreme events (long ocean swim races in Alaska), etc. all goes back to a single moment in life while I lived in Boise, Idaho. A clarifying moment of who I would become and how I would find a little extra zest in life and how I would make decisions as opportunities would cross my path. My neighbor Curt strolled by one morning and asked me a simple but complicated question. Would I like to join him and a few others to bungee jump off of a bridge near where I lived? Kayakers near the start of the paddle down the Colorado River. Photo by Dave Nevins. My mind played some games with me and I inched toward creating a reason I would or could not jump. My heart said, No, We are Not Going That Direction! A few more seconds of swirling brain waves bouncing in my head and I took a deep breath. Video of me from my camera. Filmed by Sean Crosby. Ok, maybe a few deep gasps for breath. I walked next door, rattled Curt's door and semi-confidently uttered, 'Yes'. My thought was simply and in a somewhat child-like manner were that I could not come up with a solid, valid or even heroic reason to not do the bungee jump. Colorado River from the bridge. Photo by Dave Nevins. That is how I approach decisions to take on new challenges in life. Is there a good reason not to do this? Snapshot from my Samsung 360 Camera. Interesting timing as Matthew Butterman, a type 1 diabetes acquaintance, contacted me for an article to post online at Diabetes Daily. He knew that I did not live the usual lifestyle of a person with diabetes. In the 'Out of the Box' zone! Snapshot from my Sony POV. 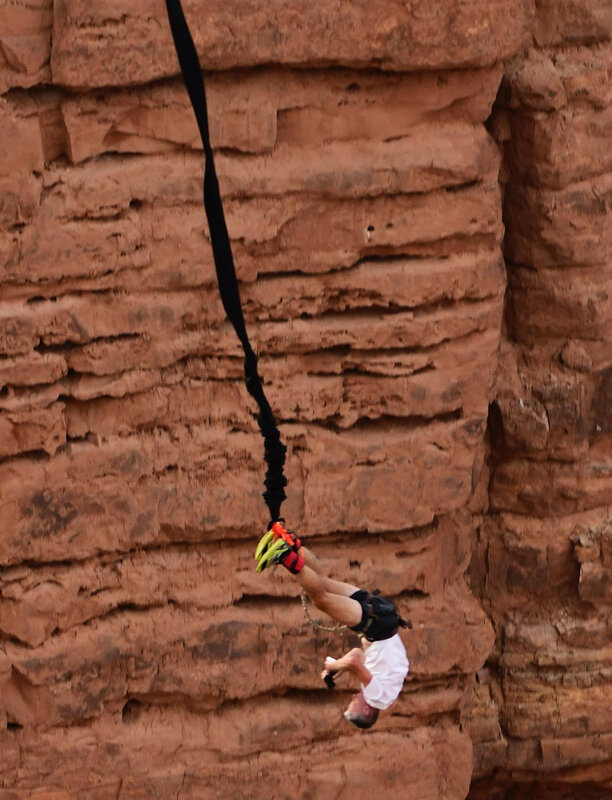 As mentioned, the timing was unique as I was doing a bungee jump at the Navajo Bridge (Grand Canyon-Arizona) very soon (all photos and videos are from this jump). Snapshot from my camera. Filmed by Sean Crosby. This was to be an extra special experience for me as it had been ten years since the last time I had connected to a bungee cord. 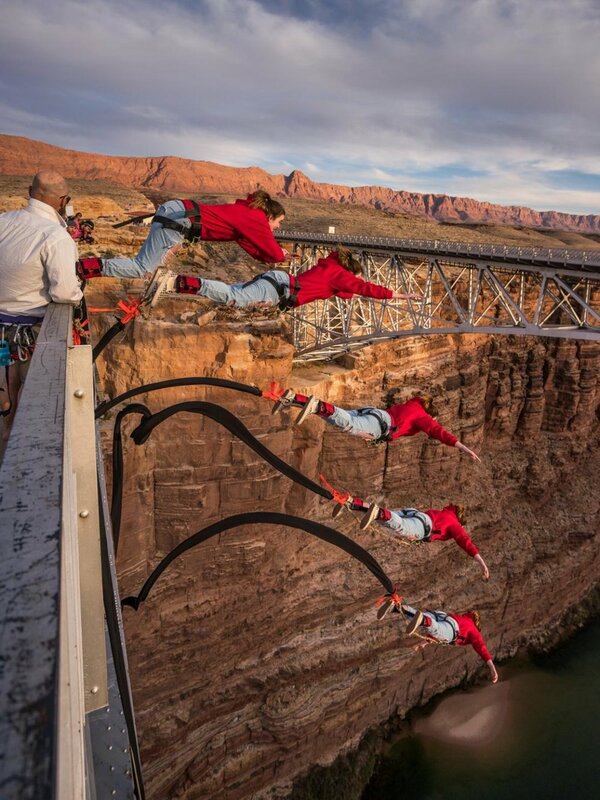 I had contacted Eric Lyman (Over the Edge, Inc. Bungee) to see if we could orchestrate a group get together at the bridge. Bingo on seeking adventures! Me - Testing Gravity. Photo by Barry Glazier. Bungee Eric had selected April 1, 2018 for our jump. No, not an April Fools Joke! 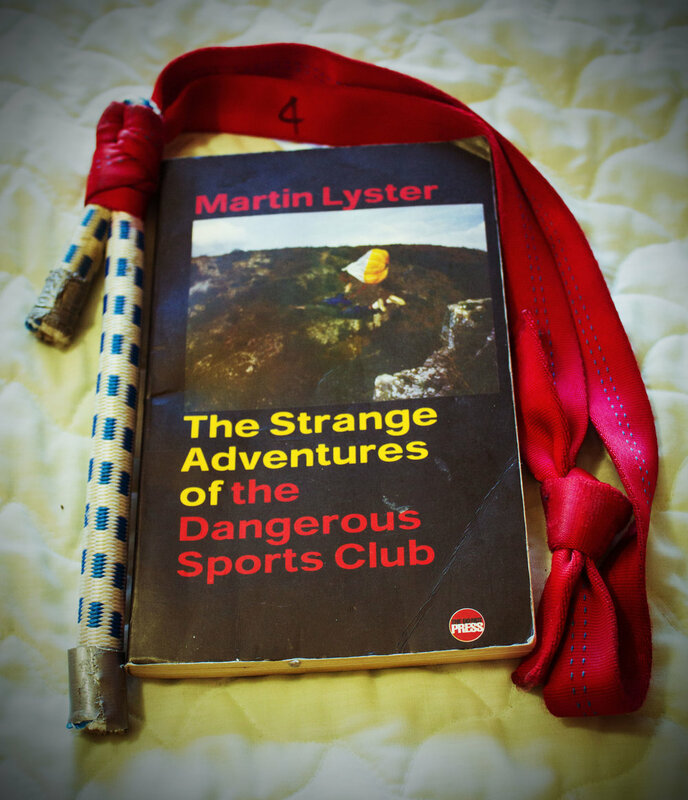 It was a nod to the Dangerous Sports Club and their first bungee jump on April 1, 1979, helping to usher in a sport that I was now attached to. Pun intended. A crazy group of people from England who traveled the world doing very interesting, unique and crazy events. Also an amusing read. Composite created by Eric Peffer Photography. I journeyed up to the bridge with Eric Peffer, who would create some excellent memories of the bungee jump via his trusty camera. We were joined by Barry and Sharon Glazier (friends from Kanab, AZ) and some of their friends. Me - ready to almost lose the camera. Photo by Barry Glazier. Alyse (video above) had come to the bridge with her family (with the Glaziers) to watch some crazy people jump off the Nav. She would get a thumbs up from her parents and would make an exceptional leap. Alyse - Composite Photo by Eric Peffer Photography. Spinning, bouncing, hanging upside down, and........ I had caught the camera and now was trying to put a camera back on my head. Photo by Barry Glazier. The day would go very well as Abe and Bryce balanced on the railing, 5, 4, 3, 2, 1 and they were in flight and no screams ensued. It was now my time to scream, or not, as I did my best to balance on the narrow railing. Did I happen to mention that the wind was fierce, howling at those whose scary moment 467 feet above the Colorado River was now turned up a couple notches. My years and years of leaping off things seemed to have soared back through my veins and I was at the low end for nerves rattling. That 5, 4, 3, 2, 1 did jingle a part of my brain that had semi-retired on my last jump in 2008, but I managed to jump in somewhat good form. If 1 hits and you are still standing, you owe Eric a 6 pack! I enjoy plummeting to the earth at race car speed but the bounce back up toward the bridge will flip flop your innards in a special manner. I expected this, but did not expect that my camera would fly off my head. Miraculously, I would catch it. Only issue now was I was spinning, bouncing and upside down and would have to put it back on my head. An incredible stroke of luck (maybe a bit of skill) but I now envisioned dropping the cam into the river far below. I was successful in mounting the Sony and I clicked into a free ride up to the bridge far above. A few anxious seconds, but so glad that I had a life moment on the media card and the life changing experiences that doing such extreme things in life can produce. Moments such as these do not happen sitting on the couch and wondering what if. Say yes to what may challenge, scare, or freak you out. The rattling anxiety is temporary, the memories are forever! 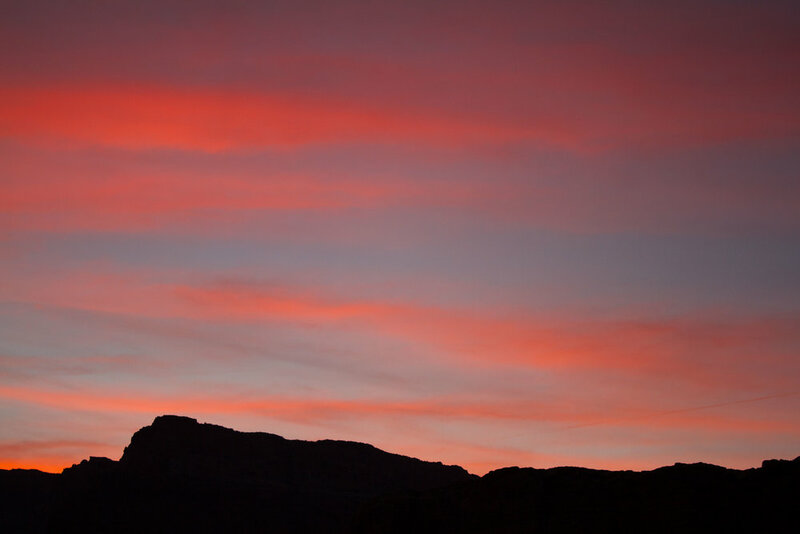 Sunset from the historic Navajo Bridge. I have shared that I am a runner at heart but adventure is plugged into my dna. For the most part I thrive with new challenges and experiences. Yes, fat biking is a thing and I am slightly addicted after riding through the desert with Billy Joe. Billy Joe was on our No Limits team of riders with type 1 diabetes who competed in 24 Hours in the Old Pueblo (mountain bike race). In his bike arena sits mountain and road bikes and two fat bikes. Just enough for the two of us to take on the desert. We zig-zagged through some neighborhoods that soon found us in front of a wash and unlimited sand and rocks. Time to ride, but very, very slowwwwwwwlllyyyy. Oh, and those fat bikes, having tires that are better suited for go carts, are also extremely heavy. They do allow you to ride in terrain that is not suitable for other types of bikes. It was grand to be back on a bike after a long hiatus off of the saddle. 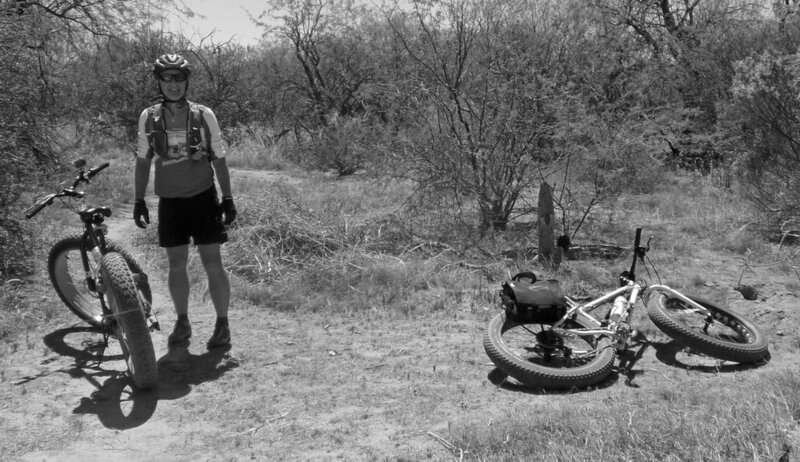 I hope to get back on my mountain bike but will be challenged by the coming three digit temperatures that will swell the desert with a zapping heat that frightens me with the horrifying thought of having a helmet on my head. Video below gives the viewer a glimpse of a rather fun sport. #8 in my vlog series. The bike path above us was bustling with weekend riders and runners enjoying their time on pavement. It was a beautiful day and the scenery, while stark in areas, afforded the quiet moments to power the fat bike through sand and over a landscape of rocks, rocks and more dang rocks. While those monster tires churned through the varied sand and rock obstacles, the bike was unsuccessful at finding victory in deep sand. Or, my skill set was not quit as deep as the unforgiving layer of sand. I did fall a few times but only one fall will be highly featured in this blog. Almost done with our route through the Pantano Wash, I found a notable rock that had my name on it and I crashed to the desert floor. Also crashing was my insulin pump which had a short but sweet meeting with the mentioned rock. The noise that my pump squealed out was loud, irritating and the sign of death as our ride was now over (except for the pedal back to Billy Joe's home). Pump was now dead and I needed to make my way to a syringe and insulin and eventually a previously used insulin pump in my archives. Not a stunning way to end the day but an excellent way to spend the day. Thanks go to Medtronic for promptly zipping a new insulin pump my way. Snapshot from the video after the crash. In a zippered binder, bout 4 feet from where I am plunking on the keys on my piece of my junk laptop, sits a nice, neat stack of loose papers that are numbered 1-293. Those pages are packed with stats, details, descriptions, maps, photos as well as many memories! One afternoon in the summer of 2001, Boise rock climbing guidebook author, Sandy Epeldi, and I were discussing the boundless potential for trail running in Boise and came to the conclusion that a trail book was long overdue. Much of my paycheck each week went toward gear at an outdoor store. That store had no Boise hiking/trail running books on its shelves as none existed - yet! A week later we were at the Military Reserve trail system to begin the fieldwork for our book. Since we were both trail runners dealing with some time contraints and some horrendously long trails to cover, we made a brave decision to run all the trails (except the canyoneering sections). This seemed to throw in a little extra challenge to a duanting project. Over a thousand miles later and 11 years........a trail book is near completion. There have been many delays: trail additions/subtractions, trail changes, kids being created, homes being purchased and remodeled, Dave moving to Alaska, other pressing projects........but Sandy, who has done the bulk of the work, has done an amazing job with incredible detail and accuracy. 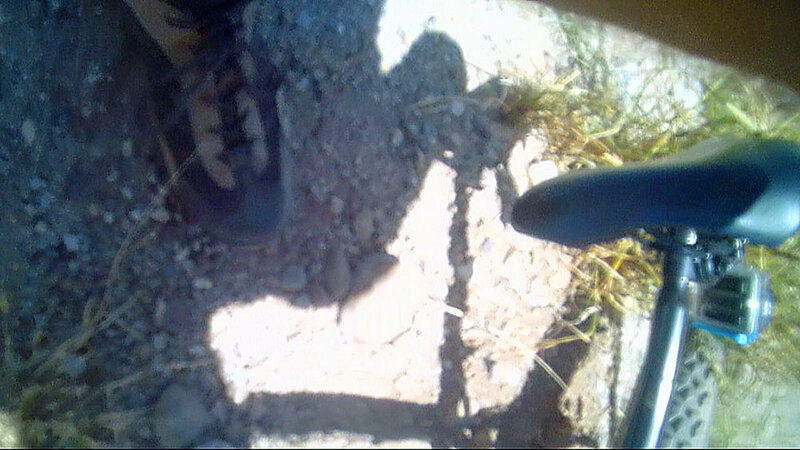 I was a grime assistant, involved in the initial coverage of trails by 2 sets of running shoes. Guess I was a partner in grime. Little did I realize that this project would slowly etch a mark on my life. Within a couple summers we would cover mileage in Idaho's backcountry that the average Idaho Joe might have a difficult time covering in a lifetime. We saw amazing sights, ran nearly endless mountain climbs, waded through deep canyon pools, endured snow, ice, scalding heat, finished in eerie darkness, scrambled some challenging rock formations,and got lost (oops, I can't list that. We are guidebook authors!). The memories pasted to the ceiling of my brain. The value of being in good shape and almost being able to keep up with Sandy. He may be a climbing guru but truth be told, the dude can run. In the loss category: weight. Favorite Area: The Owyhee's. The canyons are awesome!